Shale gas has been a pet interest of the UK Prime Minister David Cameron and his Chancellor George Osborne. The top two Tories have been painting a picture of a potential UK shale gas revolution, with investment in unconventional gas production dramatically reducing Britain’s energy costs. Having presided over a period of uncomfortable rises in energy bills, a US style shale gas revolution must seem like an attractive prospect. But the prospect of UK shale production having a substantial impact on UK energy prices is nonsense, given the UK’s interconnection with the European and global gas markets. Shale gas has been a pet interest of the UK Prime Minister David Cameron and his Chancellor George Osborne. The top two Tories have been painting a picture of a potential UK shale gas revolution, with investment in unconventional gas production dramatically reducing Britain’s energy costs. In America they are now almost self-sufficient in gas. Their gas prices to business are now less than half as much as ours are and the reason for this is they have put a lot of investment into unconventional gas. Having presided over a period of uncomfortable rises in energy bills, a US style shale gas revolution must seem like an attractive prospect. But the prospect of UK shale production having a substantial impact on UK energy prices is nonsense, given the UK’s interconnection with the European and global gas markets. Despite this fact, sections of the UK government and UK press have jumped on a consultant report released by DECC as evidence of the potential for UK shale gas production to reduce gas prices. This misrepresents the findings of the report and illustrates the growing gap between the government’s rhetoric and reality on shale gas. There have recently been some positive signs for shale gas development in the UK. The British Geological Survey announced a substantial rise in UK shale gas resource estimates to 1300 tcf (36 TCM) in June. While a large portion of those reserves may never be economically recoverable, Centrica’s 25% investment in the UK’s largest shale gas company Cuadrilla has provided a boost to the commercial prospects for UK shale. But two big hurdles remain for UK developers in the form of environmental and infrastructure planning constraints. Evidence from the US and Australia suggests that if the public is going to remain onside, it is important for the government to ensure robust and transparent regulation of these areas. Recognising these constraints, it makes sense for the government to provide tax breaks for development of the UK’s unconventional gas reserves to replace the rapidly declining reserves in the UK North Sea. But the government’s mistake is trying to drum up support for shale gas based on a false premise. This is about jobs and security of supply, not lower UK gas prices. 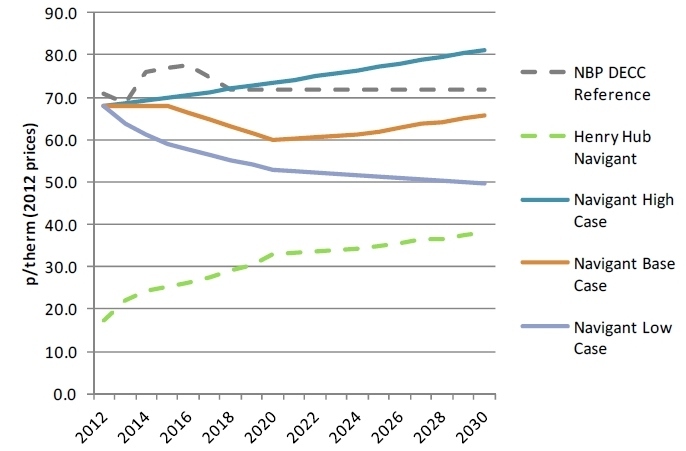 Even in the Low or “Optimistic” scenario in the report where prices fall further, this is due to further oil price declines and global development of unconventional gas, rather than any specific impact of UK shale production on UK gas prices. The dramatic reductions in US gas prices are a result of a gas being ‘trapped’ in the relatively isolated North American gas market. As shale gas production has rapidly increased over the last 5 years, prices at the US Henry Hub have been driven down towards the variable production costs of shale developers. Infrastructure and policy constraints have created a temporary barrier inhibiting the flow of cheap US gas to higher valued markets in Europe and Asia. Unlike the North American market, the UK gas market is not isolated. There are two large interconnectors between the UK and Continental Europe. There is also a large pipeline network from the Norwegian Continental Shelf that ensures price linkage between the UK and the rest of Europe. In addition, the UK and, more broadly, Continental Europe are tied into the influences of the global gas market via LNG import infrastructure. Regardless of how much shale gas is produced in the UK, the price for gas in the UK will be determined by the pan-European supply and demand balance. The cost of marginal supply, predominantly flexible Russian pipeline volumes, will continue to be the key driver of prices across the interconnected network of European gas hubs until well into next decade. This remains the case even under heroic assumptions where growth in shale production returns the UK to its former gas exporter status. If the government can create an effective regulatory framework then UK shale production can contribute to security of supply, employment and the UK’s balance of payments. But it is not going to significantly drive down Britain’s energy cost base.